"Jeff's the reason I'm leaving town. I'm going down to Mexico. I know that he's there. Well, I don't know that he's there, but I'm sure that he's there, if you know what I mean." 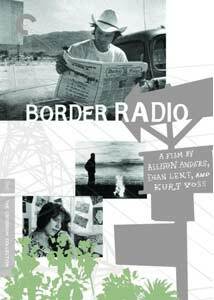 By the time 1987 rolled around, filmmakers Allison Anders, Dean Lent, and Kurt Voss had spent four years making Border Radio under a veil of very lean finances and lots of creative vision, and it is probably no coincidence that the film's characters live in a similar world. Taking its name from a song by the roots music band The Blasters, the setting is the fringe world of the L.A. post punk music scene, where talent doesn't necessarily equate to wealth. Anders, Dean, and Voss fluctuate between genres and styles, often alternating the approach as a documentary or a kind of western/punk noir. An underground punk frontman (The Flesh Eaters' Chris D.) has fled to Mexico after taking part in robbery, causing his rock journalist wife (Luanna Anders) to try and track him down, using a drunken bandmate (X's John Doe) and a horny wiseass (Chris Shearer) as argumentative partners. The task at hand, however, isn't really the focus here, and instead Border Radio exists as a rough travelogue into the realm of the world that produced bands like X, The Flesh Eaters, and The Gun Club. In fact, the whole story of will-he-or-won't-he-come-back pales next to the sheer weight of the setting, a look at a time and place that has long since been paved over by what has come after . The legitimacy of having real-life musicians in not just lead roles, but in an assortment of smaller parts, lends the right kind of this-is-L.A.-punk honesty to it all. Dave Alvin (The Blasters), Julie Christensen (Divine Horsemen), Iris Berry (The Ringling Sisters), and Texacala Jones (Tex & The Horseheads) show up here, as do performances by bands like Green On Red and Billy Wisdom & The Hee Shees. It doesn't seem gimmicky, it just seems real. Or more importantly, natural. And that helps layer on a necessary coating of coarse 16mm docu-realism. Oddly enough, as a filmmaking narrative, Border Radio isn't all that compelling. If I can get buzzwordy for a second, it's the 30,000-foot view that is the selling point after all of these years. While Luanna Anders, John Doe, and Chris Shearer play well off each other, I never was really all that concerned whether Chris D.'s tormented singer Jeff would reach an epiphany in Mexico or not. What I liked was the tiny slice of the long gone grubby music world that Anders, Lent, and Voss set the story in. Image Transfer Review: The new full frame black-and-white transfer was culled from an original 16mm duplicate negative. Even with Criterion's promise of having "thousands of instances of dirt, debris and scratches" removed, this new print can't do all that much to separate itself from the film's low-budget roots. Plenty of grain and the occasional contrast issue, but in general Border Radio has cleaned up fairly well, considering it was something of a bootstrap project to begin with. Some scenes, such as the stairwell moment between Luanna Anders and Dave Alvin, are unfortunately marred by a vertical line of some type, though that is probably the most severe example of a flaw on this disc. Audio Transfer Review: Audio is offered up in Dolby Digital 1.0 mono that has been cleaned up to reduce hiss and clicks. Not much in the way of any real depth to the presentation, and some sequences do clip slightly. A bit tinny in spots, though dialogue is clear even during its weakest moments. Extras Review: Included inside the clear plastic case is a black-and-white 16-page booklet with photos, cast and music info, as well as an article about the film entitled Where Punk Lived, written by the Hollywood Reporter's Chris Norris. Two commentary tracks are available, one with directors Allison Anders and Kurt Voss, the other with cast members John Doe, Dave Alvin, Chris D., Luanna Anders, and Chris Shearer. The Anders/Voss track alternates between connecting the dots on the project's origins and the close parallels to the real-world LA punk scene, pointing out groovy insider info on places like the Hully Gully recording studio. The cast track is pieced together from two separate recording sessions from 2005 and 2006, and if nothing else is rare chance to get three key LA punk names together at one time. There's talk of how certain scenes were tweaked and changed, chuckles about continuity issues and in general a kind of hip nostalgic remembrance about the time period. Nine deleted scenes run a total of 23m:20s, and feature unused material like Dave Alvin and Luanna Anders talking in a bathroom or another cut of the heist sequence. The footage is all in pretty rough shape, and it reinforces the strong restoration job done on the feature. The supplements conclude with Echo Park, a series of photographs taken by Dean Lent two years into the film's production, a 1982 blood-soaked music video for The Flesh Eaters' The Wedding Dice (04m:42s), featuring a guest appearance by Mary Woronov, as well a theatrical trailer and radio spot. The disc is cut into 14 chapters, and features optional English subtitles. An occasionally meandering but always gritty fly-on-the-wall peek at the inner machinations of the post-punk L.A. music scene gets the Criterion treatment, meaning this title will certainly get more attention now than it probably ever did back in 1987. It might help if you're a wee bit familiar with the remnants of the 1980s punk movement, because it will give you a little more to chomp onto as events, or lack thereof, unfold.